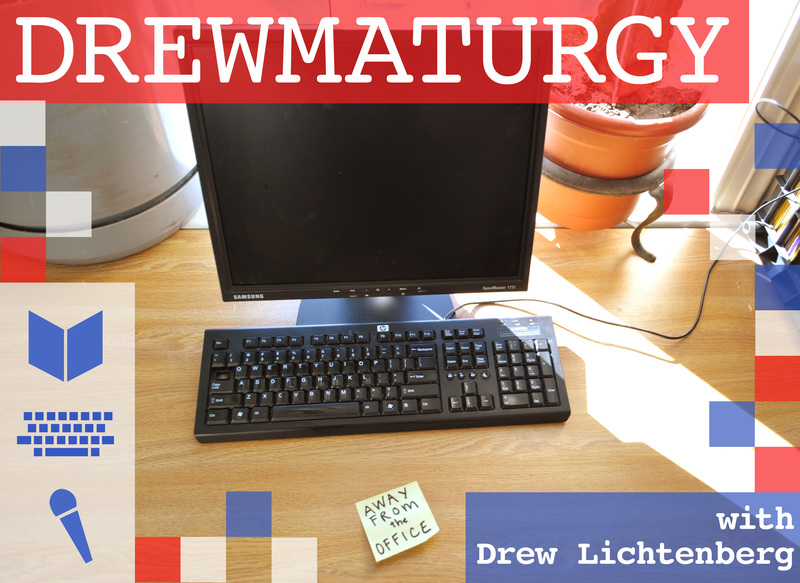 In my last Drewmaturgy post, I told the story of how I came to work on Les Blancs. 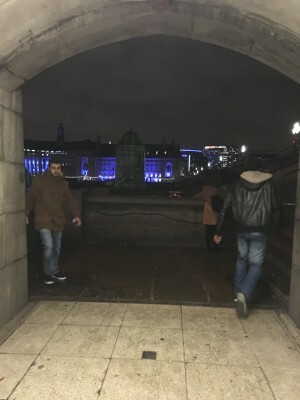 Now, in short order, a report on the process, as well as some notes and observations from my time in London. I remember flying to London four weeks ago, landing at Heathrow on a typically grey London morning. I got to my flat in Brixton (south London, a bit like Astoria in look and feel) and collapsed, only to wake about five hours later to a few emails to Yaël, who wanted to meet and map out a plan for the first week. 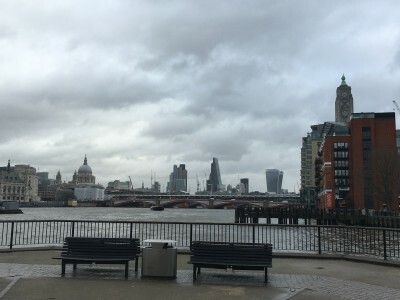 I hopped a bus to Brixton station, took the tube to Westminster, and walked out to one of the most dramatic panoramas in Europe: Big Ben, the London Eye, and the South Bank of the Thames. 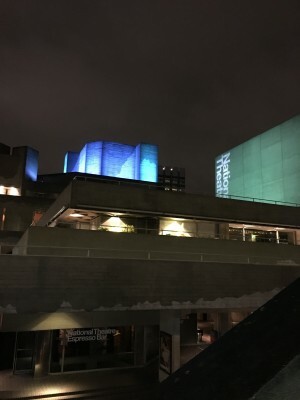 I walked across Waterloo Bridge and a few minutes later there I was, at the National Theatre. [Click on photos to see at full resolution. 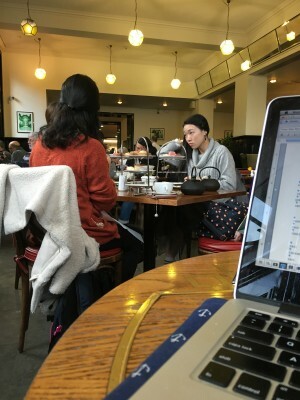 All photos taken by Drew’s iPhone.] The London skyline as seen from Westminister. 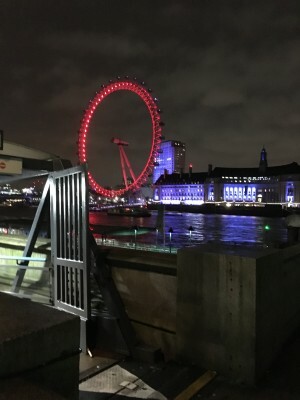 The London Eye, which interestingly enough is officially “the Coca-Cola London Eye.” We wonder what the good people at Irn Bru, a popular Scottish soda, have to say about that. 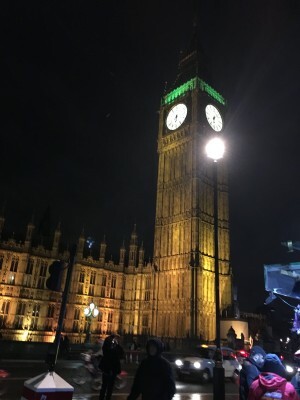 Big Ben all lit up. 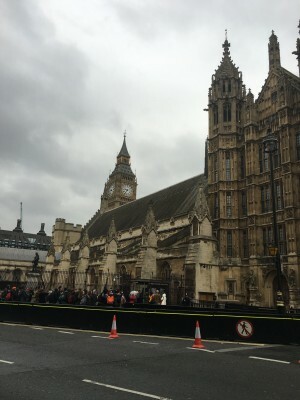 Westminster Abbey has its own Twitter feed (@wabbey), which tells audiences about upcoming events, historical information, and even details when and for what purpose the bells are chiming. The central London skyline from the other side of the National Theatre. No picture can truly capture the enormity of the NT. 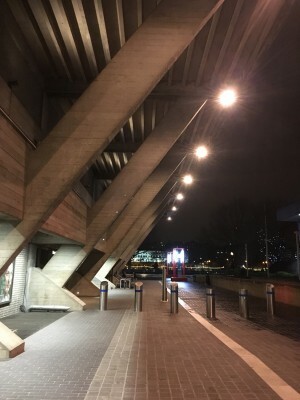 It’s essentially a vast concrete embankment employing more than 1,200 people a year, a relic from the bygone era when much of central London had been bombed out during World War II, and had to be subsequently rebuilt, in the iconic Brutalist style. 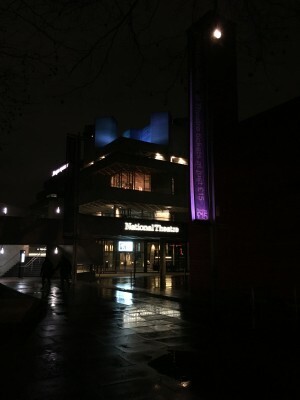 The National Theatre, officially the Royal National Theatre, was founded in 1963. It moved into its current headquarters in 1976. The building’s architectural style “Brutalism” was named after the French phrase for raw concrete (béton brut). Concrete remains one of the predominant materials for the fortress-like buildings made in this style. The Brits have some of the best examples of this style of architecture. 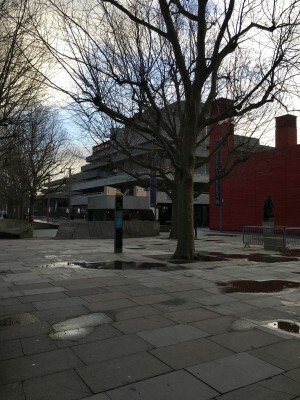 The National Theatre, designed by Denys Lasdun, is certainly one of the most famous. As a warning to all dramaturgs, the current weight restrictions for luggage on international flights is set at 50lbs (23 kg) per bag. 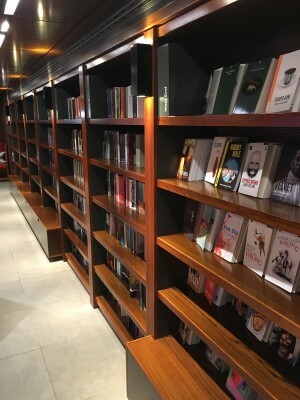 Remember that fact if you ever choose to wander into the famous bookstore at the NT. The NT lobby benches offer visitors a place to read the few (dozen) plays they picked up in the bookstore. They are also a welcomed break from the grey of the sky and building. Look familiar? That coffered concrete ceiling effect is also employed at several metro stops around Washington, D.C., including the Harman’s own Metro Center. Of course, there are three theatres (not including the “Shed,” a red wooden structure erected years ago that has remained as a home for experimental work). 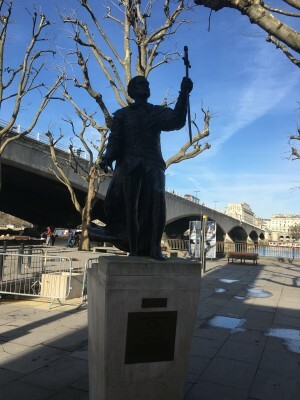 Most famous, and the future home for Les Blancs, is the Olivier, named for founding artistic director Sir Laurence Olivier. It supposedly has the best sightlines in the world, its 180º sweep based on the theatre of Dionysus in Athens. There’s no true correlative for it in the American theatre world, although staffers talk about it, to my own delight, as a “tricky” space much the same way we talk about our own Sidney Harman Hall. 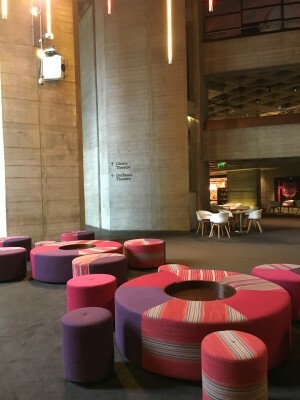 Underneath and on top of the lobby, buried deep into the banks of the Thames and heaped up atop it like concrete megaliths rising into the London sky, are the actual workshops, rehearsal rooms, and offices of the National. Everything is centralized. 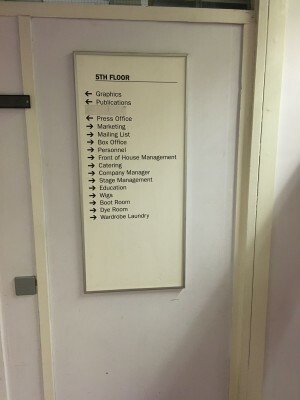 Let me repeat that: it is all in one building. 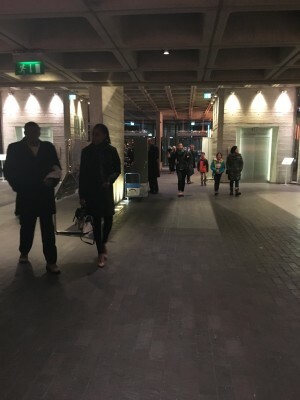 It’s more than a bit destabilizing for an American theatre professional to enter a European theatre building where everything has been built for the explicit purpose of making theatre. Unless you work at the Centers Lincoln and Kennedy, odds are if you work in American regional theatre that your theatre is located in a converted space. Of the theatres I’ve worked at, almost all of them have been converts: Yale Rep (the former New Haven Calvary Baptist Church), the Public (the former New York City Armory), Center Stage (the former Loyola College and Prep). The Lansburgh, lest we forget, was a department store before it became the home of the Shakespeare Theatre on 7th Street NE. 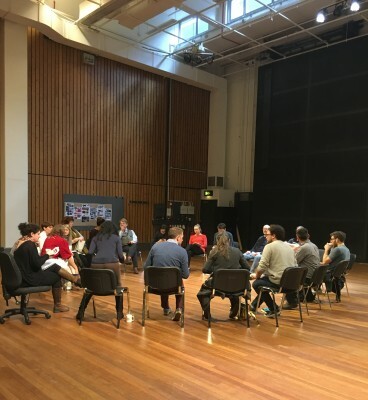 I explain this to the British actors in our cavernous rehearsal room (there is one built expressly to mimic the contours of the Olivier, and even more amazingly, it has a working, mechanized revolve). They stare back at me, blankly, as if I’ve gone mad. 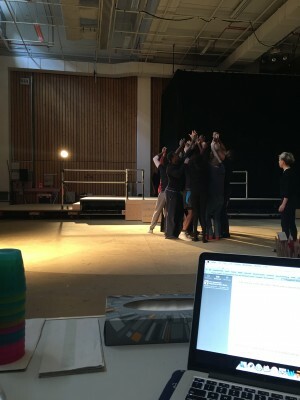 Actors and Yaël gather under the sunlight in the rehearsal hall. If the London weather does not cooperate, the halls are equipt with theatrical lighting. Again, that is not common in American rehearsal facilities. Because American theatre often must repurpose old buildings, rehearsal halls are sometimes quite different than performance spaces. In one of STC’s rehearsal halls, a set of pillars (required for the structural integrity of the building) divides the space in ways that do not match our stages. Having the facilities to permit artists like Yaël Farber, who incorporates design beautifully into her direction, to work with even basic lighting in the rehearsal room is enough to turn any American theatre company green with envy. Another quirk of the National is the halls of the non-public spaces, which have been designed to squeeze around the lobbies and theatres. If the outside spaces themselves offer the illusion of infinite space, the insides of the theatre puncture that illusion decisively. It’s a bit like discovering who the Wizard of Oz is, behind the curtain. 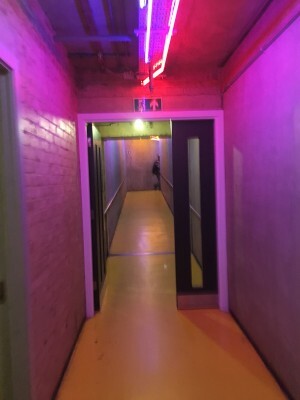 If you ever join the company, you quickly become adept at winding your way through these labyrinthine, utilitarian halls, all of which look identical to each other. There’s a certain kind of soviet chic to the place – all that carpet, all that concrete – it reminds me of the vast apartment blocs I saw in the former East Berlin. In a good way. 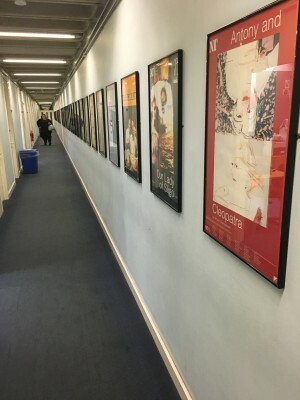 One of the many labyrinthine halls of the NT has framed posters of past productions. Luckily, there are road signs. Again, everything is under one roof. One of my favorites is the “yellow brick road” greeting actors and directors when they walk from the Stage Door entrance down into the subterranean rehearsal rooms. Dorothy, we’re not in the Lansburgh anymore. 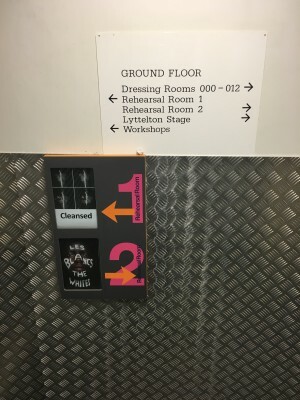 There’s also a hallway on the second floor that is eerily quiet, because it’s situated immediately in between the engine room and the stage door of the Olivier. The National is like that, filled with curious little surprises and discoveries that one only gets used to through repetition. Also: the South Bank is an absolute food desert. There’s a reason why the National has built so many restaurants out in its lobby: the paucity of food options in the immediate walkable area. In another case of of-course-they-have-this, which nonetheless left me utterly flabbergasted, the National has a fully operational, all-day canteen in which actors and company members can fill up on the cheap equivalent of cafeteria food. I was confused on my first week as to where the actors all vanished during lunch, and where Yaël was coming from with biscuits and cheap coffee until I discovered the canteen. They make a pretty good curry, actually, although nothing will ever make me understand the British fondness for Pret a Manger style sandwiches with egg cress and mayonnaise, or weird cold salads with smoked meats. Ghastly concoctions. Anyways, I was utterly amazed. The idea of an American theatre employing lunch ladies and clerks, from early in the morning until late in the evening, simply to make food for the members of the acting company and staff … it’s inconceivable. I like to think that STC is a big theatre company, and by American standards it is, but it simply pales in size to an operation on the scale of the National. I’d be very curious to take a look at their operating budget, just for a month. I’m sure it would completely blow my mind. Adding to my gastronomic observations, I was amused to see that the British fixation on tea even carries through to Stage Manager rituals. It’s a stage management custom here to bring “tea biscuits,” i.e. cookies and candies in a tin, many of them quite deadly and with amusingly British names (“jammie dodgers,” “hobnobs”), offered gratis for the company to imbibe. All rehearsal rooms even come with a spigot of hot potable water, all for the sake of actors drinking tea. The British are dead serious about tea. I feel like a barbarian ignoring it and going straight for the coffee. 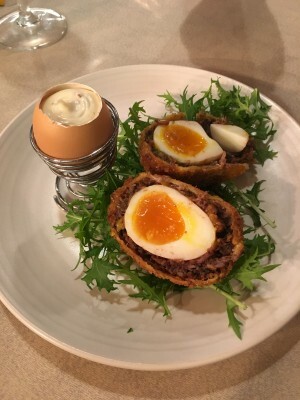 Acclaimed British chef April Bloomfield describes a scotch egg as “breakfast in one bite.” While we might suggest taking it in two or three, we think they’re pretty damn near perfect. The tradition of “afternoon tea” is often credited to Anna Maria Russell, Duchess of Bedford (1783 – 1857), though some contest that it was actually Queen Catherine of Braganza (1638 – 1705). Needless to say, the debate is a heated one, steeped in history. 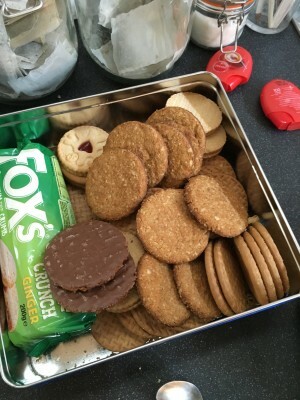 No “cuppa” would be complete without a tin of biscuits. The tea set up in the rehearsal room was serious business. 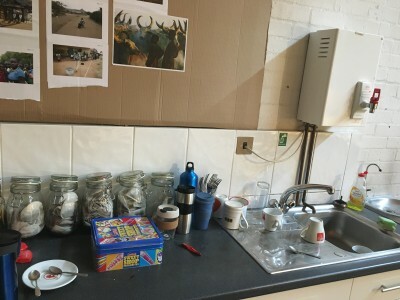 Note the hot water spout above the sink, the biscuit tin, the used teaspoons (politely laid on a plate and not the counter), and the lonely espresso cup kept around for visiting American dramaturgs. 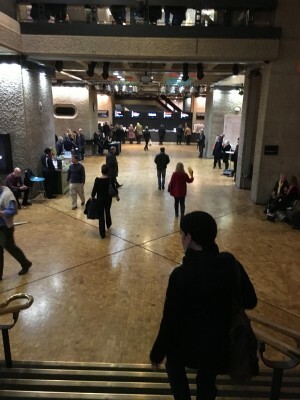 My second weekend here, Yaël and I went to another concrete colossus, the Barbican Arts Centre. The Barbican is one of my favorite places in the world, and just as mind-melting as the National. It is from the most bomb-damaged part of central east London, and it houses an opera house, an experimental theatre, a movie multiplex, and numerous restaurants, as well as apartment housing. The repertory is on the experimental side. Imagine the Watergate combined with the Kennedy Center, offering up international regietheater (directors’ theatre) worthy of the Brooklyn Academy of Music. We were seeing The Encounter, a virtuosic one-man show starring Simon McBurney, the legendary artistic director of Theatre de Complicité. Every seat was equipped with headphones, and after we put them on, McBurney used directional microphones, audio tape, and prerecorded media to tell us, aurally, the story of an American journeying into the Amazon. He encounters the Mayoruna there, a tribe who has never before been documented or photographed. While I found parts of the narrative reminiscent of Rousseau’s essays on native Americans, I was astounded by the level of technical innovation, of the sheer theatrical transport of McBurney’s dramaturgy. As I have often in my four weeks here, I thought of the American theatre. In many ways, big and small, there is no comparison to what you can see and experience in London. Yaël can now be counted among the over 1.8 million people who enter the Barbican annually. 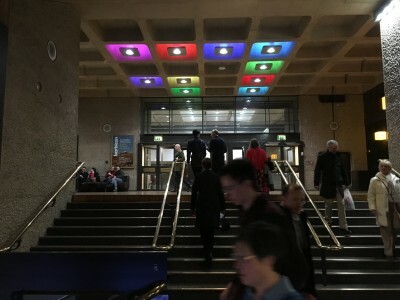 The Barbican has another example of the favorite Brutalist architecture feature: coffered (or “lacunar”) ceiling, this time with rainbow lighting.